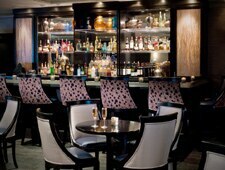 Swank boutique hotel restaurant offering upscale takes on contemporary cuisine. : Located just south of Costa Mesa’s shopping and arts district, this featured restaurant of the Crowne Plaza Costa Mesa Orange County has a sleek, quasi-retro design that feels sophisticated yet comfortable. Executive chef David Fune has been given full reign to push the envelope with his contemporary cuisine, which results in a forward-thinking menu with an adherence to seasonality and fresh ingredients that blows past the norm long associated with hotel restaurants. Start your meal with the venison mac ‘n’ cheese; black mussels swimming in Chardonnay, fresh herbs and butter broth; or salads such as the burrata and citrus caprese. Entrées range from flatbreads to beef, pork, poultry and fish dishes, such as chicken raclette or the trio of pork osso buco, braised cheek and roasted medallion. The fun wine list has been finely tuned to be approachable and versatile enough to match whatever main course is ordered. Desserts feature an arrangement of whimsical treats, including a few grown-up interpretations of childhood favorites like Kit Kat and Snickers bars. Hotel guests and locals alike can also stop in and enjoy breakfast and lunch items that boast an equal measure of thought and careful preparation.